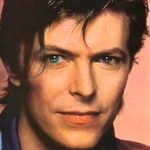 Also Known As: "David Bowie"
David Robert Jones (8 January 1947 – 10 January 2016), known professionally as David Bowie (/ˈboʊi/), was an English singer, songwriter and actor. He was a figure in popular music for over five decades, regarded by critics and musicians as an innovator, particularly for his work in the 1970s. His career was marked by reinvention and visual presentation, his music and stagecraft significantly influencing popular music. During his lifetime, his record sales, estimated at 140 million worldwide, made him one of the world's best-selling music artists. In the UK, he was awarded nine platinum album certifications, eleven gold and eight silver, releasing eleven number-one albums. In the US, he received five platinum and seven gold certifications. He was inducted into the Rock and Roll Hall of Fame in 1996. David Bowie was born David Robert Jones in Brixton, London on 8 January 1947.His mother, Margaret Mary "Peggy" (née Burns), of Irish descent, worked as a cinema usherette, while his father, Haywood Stenton "John" Jones, was a promotions officer for Barnardo's. The family lived at 40 Stansfield Road, located near the border of the south London suburbs of Brixton and Stockwell. A neighbour recalled that in a world still feeling the effects of post-war depression, "London in the forties was the worst possible place, and the worst possible time for a child to grow up in. "Bowie attended Stockwell Infants School until he was six years old, acquiring a reputation as a gifted and single-minded child—and a defiant brawler. The family moved in 1953 to another nearby suburb, Bromley, where, two years later, Bowie progressed to Burnt Ash Junior School. His singing voice was considered "adequate" by the school choir, and his recorder playing judged to demonstrate above-average musical ability. At the age of nine, his dancing during the newly introduced music and movement classes was strikingly imaginative: teachers called his interpretations "vividly artistic" and his poise "astonishing" for a child.The same year, his interest in music was further stimulated when his father brought home a collection of American 45s by artists including Frankie Lymon and the Teenagers, The Platters, Fats Domino, Elvis Presley and Little Richard.Upon listening to "Tutti Frutti", Bowie would later say, "I had heard God".Presley's impact on him was likewise emphatic: "I saw a cousin of mine dance to ... 'Hound Dog' and I had never seen her get up and be moved so much by anything. It really impressed me, the power of the music. I started getting records immediately after that." By the end of the following year he had taken up the ukelele and tea-chest bass and begun to participate in skiffle sessions with friends, and had started to play the piano; meanwhile his stage presentation of numbers by both Presley and Chuck Berry—complete with gyrations in tribute to the original artists—to his local Wolf Cub group was described as “mesmerizing ... like someone from another planet.”After Terry Burns, Bowie's half-brother, introduced him to modern jazz, his enthusiasm for players like Charles Mingus and John Coltrane led his mother to give him a plastic alto saxophone in 1961; he was soon receiving lessons from a local musician. Failing his eleven plus exam at the conclusion of his Burnt Ash Junior education, Bowie joined Bromley Technical High School. Bowie met his first wife, Angela Bowie, in 1969. Her self-confidence and unorthodox dress sense were a significant influence on his early career and rise to fame. They married on 19 March 1970 at Bromley Register Office in Beckenham Lane, Bromley, London, England where she permanently took his adopted last name. Their only son, Zowie, was born on 30 May 1971. Zowie later preferred to be known as Joe, or Joey, after which he reverted to his legal birth name, "Duncan Zowie Haywood Jones". David and Angela Bowie initiated divorce proceedings in Switzerland in late 1979; after months of court battles, the marriage was ended on 8 February 1980. Bowie married his second wife, the Somali-born supermodel Iman, in Lausanne, Switzerland on 24 April 1992. They celebrated their marriage later that year in a civil ceremony at the Saint James' Church in Florence, Italy. Their daughter, Alexandria Zahra Jones (known as Lexi), was born 15 August 2000, and lives in Manhattan and London. Bowie lived in Switzerland from 1976 until 1998. He was based in a large chalet in Blonay until 1982, then moved to an early twentieth-century residence called the Château du Signal, in Lausanne, which was built by a Russian prince and decorated with woodwork and ornate faience pottery. David Bowie's father was John Jones (full name Haywood Stenton Jones), who died in 1969. His mother is Peggy Burns (full name Margaret), of Irish Catholic ancestry. Now over 80 years old, she reportedly lives in an exclusive 600-pound-a-week retirement home in England. He had an older step brother, Terry via his mother's previous marriage, who suffered for many years from schizophrenia, and was in and out of mental institutions over the years. Terry committed suicide in 1985. Bowie did not attend the funeral, fearing his presence there would turn it into a media event. He also has a step sister named Annette on his father's side. The family lost contact with Annette. Bowie has been married two times. His first marriage was to Mary Angela ("Angie") Barnett in 1970. The couple separated and later divorced. He has one child, Duncan Zowie Heywood Bowie (who sometimes goes by the name of "Joe") born in 1971 by Angie. He remarried supermodel Iman Abdulmajid (usually known just as "Iman") in 1992. The couple currently have no children.